In 2011, females had a lower suicide rate than males. The rate for males was almost four times the rate for females. 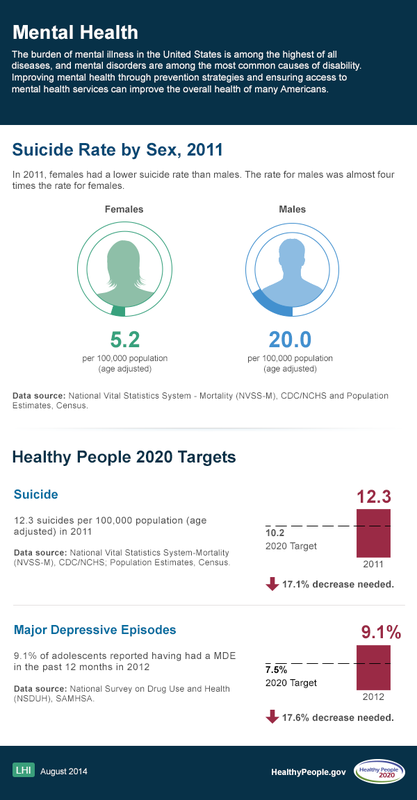 Data source: National Vital Statistics System — Mortality (NVSS-M), CDC/NCHS and Population Estimates, Census. 12.3 suicides per 100,000 population (age adjusted) in 2011. 17.1% decrease needed to meet the target. 9.1% of adolescents reported having had a MDE in the past 12 months in 2012. 17.6% decrease needed to meet the target.